As commentaries on Ephesians go, I generally find myself regularly going back to John Chrysostom and his homilies on Ephesians. The fact that he is a native speaker of the language within a few hundred years of Paul makes his comments rather valuable. There are, of course, a couple caveats with that. For one, while the Greek language has changed surprisingly little, those three hundred years between Paul and John are still three hundred years. That’s plenty of time for things to change. And also, we must make a distinction between John Chrysostom’s opinions about what Paul meant and his intuitions about the Greek language. The latter are significantly more valuable to us because they say something about how a native speaker would have understood Paul. The former are significant in showing what was ambiguous to discern by Greek speakers. There is a gap between what we as native English speakers think is ambiguous and what the native Greek speaker would think is ambiguous. Native speaker intuition isn’t going to tell you anything about background material, so any of his comments on that stuff is ruled out. Grammatical or lexicon statements that seem to mainly provide homiletically or practical discussion rather than historical discussion of what Paul actually meant are likely to be less reliable. Places where Chrysostom assumes a particular view regarding grammar* without any kind awareness of other possibilities are potentially significant. The important comments are will often be the ones he makes in passing without much reflection. Unless you’re relying on a critical text (and not much has been done with Chrysostom), don’t place much weight on his exposition textually suspect material. Most (all?) of Chrysostom’s writings in Greek are only available in Migne’s Patrologia, which is based on very late manuscripts. But even with these, I would still advise caution. Then there’s the challenge that John Chrysostom wrote in Greek and that the only complete translation of his homilies on Ephesians are themselves more than 150 years old. The translation is both awkward and unnecessarily literal – almost to the point of being unintelligible at times. Now I read Chrysostom in Greek simply for immersion purposes, but often times, I want to read what he’s saying in English so that I can follow it better. 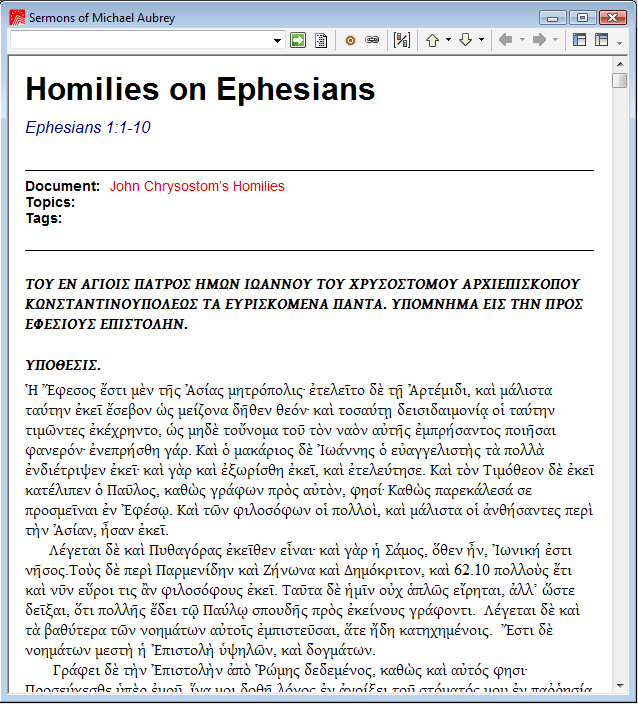 I recently figured out a way to do that using Logos Bible Software’s Sermon File Addin so that I can make my own translation. 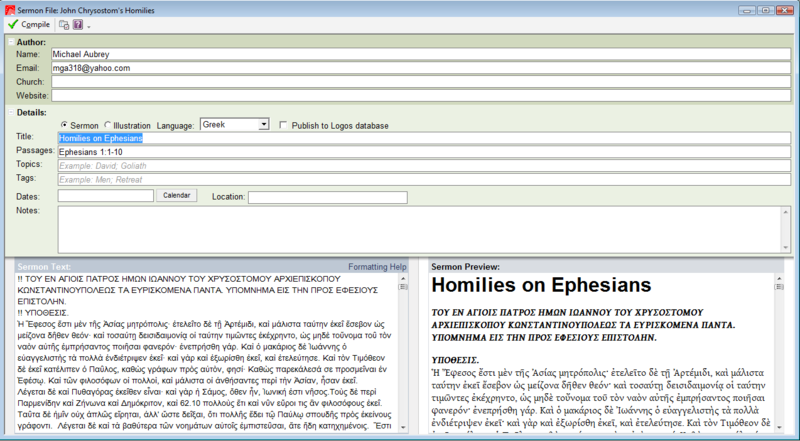 After editing the line numbers from the TLG texts from http://www.documentacatholicaomnia.eu/ out of the PDF, I copy and pasted the text into the sermon file addin, set the language to Greek, did some more paragraph editing and hit compile. Now its a separate searchable resource in Logos. If the given word is already a lexical head word in a dictionary, I’ll be taken directly to it first though, which is more convenient anyway. This way, I’ll be able to survive until the Patrologia Cursus Completus, Series Graeca is available. *I am not differentiating here between grammar and lexicon. I’m cynical about how great a distinction one can draw between those two. Both are acquired at the same time by a speaker in parallel to each other. Thanks for the tip. I just downloaded the Sermon File Addin and I’m going to get started on putting some Athanasius in there. I can’t seem to find the Addin in my library. Where should I be looking for it? Doing what I did required a good bit of editing, so you’ll want to read a bit of the help file that explains formating. Also note that if you don’t want to send your sermons to Logos’ database (which is a sort of community effort: http://sermons.logos.com/), you’ll want to uncheck that box. Whoa… this theme was different a few minutes ago. Anyway, thanks Mike, I figured it out, and I didn’t send it to the database either. I don’t know how much of this I’ll be doing though, given all the editing that has to take place, but the few paragraphs I’ve done so far turned out pretty good. I’m still getting my bearing with Logos as a whole though so it’s going to be a while before I’m able to do anything too creative. Yeah, I understand. I hope that at some point there update it so that it has easier editing – like what we have in wordpress or something. Thanks for this too. I don’t have Logos. I am going to be spending much of 2009 writing a thesis on Chrysostom’s homilies on John though. 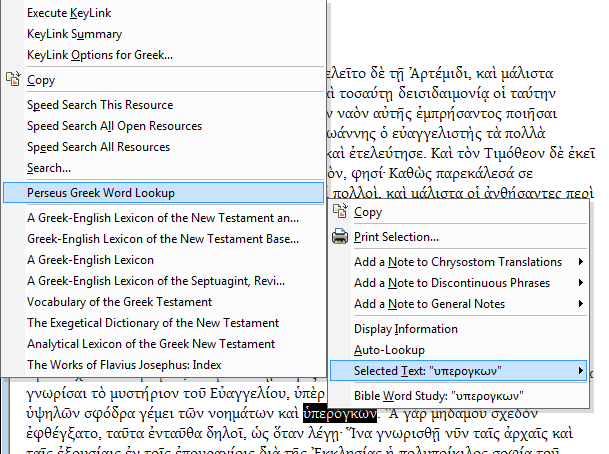 How have you found Chrysostom’s Greek? Did I miss something? Unless I was clicking on the wrong thing the PDFs on the Documenta website are page images, not text. Or were you saying you just grabbed the text from TLG? Mike H.: Documenta is obnoxiously difficult to navigate. There are images for most everything, but many of the authors have text pdfs. Documenta has posted them with permission from TLG. The best way to find things is to click on “Conspectus Rerum Auctorumque Alphabeticus.” Then choose the letter at the top for the author you’re looking for. Thus, “I” For Ionnes Chrysostom. You have to think in the Latin alphabet. Sorry, I read that too fast. Some of it is a challenge, but I’m holding my own for the most part. I’ve found his use of anaphora interesting, at least thus far. In terms of style is a whole new ball game compared to much of the New Testament. Re: page images. Ah I guess I didn’t click on the right link. I was looking at other pages. I was just trying to figure out why you were copying them from such a ridiculous format if you had access to TLG. I wish I had access to TLG! I put in my resume at Regent’s library almost just for that purpose a while back. Trinity Western doesn’t have access that I know of. just found out that it does! Thanks again for this old post, I’ve had it saved for months, and am now following your helpful instructions to add-in Chrysostom’s sermons on John! Its pretty great. For your thesis? I’ve been adding 1 Corinthians lately – and hopefully I’ll post a couple translations in the next couple weeks. For the thesis indeed. Will upload translations as I go (88 sermons is a lot to get through).